From The New Criterion. February 28, 2015. 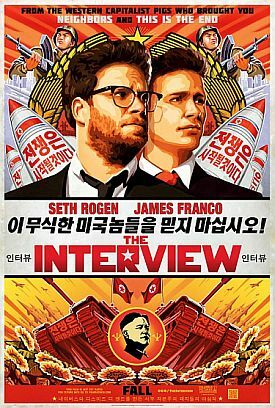 There is a good joke in Evan Goldberg’s and Seth Rogen’s film The Interview which, since it was made, has taken on a new dimension of meaning that the authors could hardly have intended. The picture’s premiss is that the real-life North Korean dictator, Kim Jong-un (Randall Park), forms a close bond of friendship with a fictional American talk-show host named Dave Skylark (James Franco) who specializes in celebrity gossip and adolescent pranks — because both are egregious cases of arrested development. Over their relationship, however, hang threats from both sides: a nuclear attack on America on the one hand and, on the other, a CIA assassination plot against the dictator that Skylark and his producer and sidekick, Aaron Rapaport (Mr Rogan), are supposed to carry out. Both prospects recede as Dave and Kim grow more intimate and, like schoolgirls, exchange confidences about their mutual love of margaritas and the songs of Katy Perry and their mutual pain from having been brought up by overbearing fathers. "You know what’s more destructive than a nuclear bomb, Dave?" says Kim plaintively to his guest and new best friend at one point. "Words." Messrs. Goldberg and Rogen, assisted by screenwriter Dan Sterling, might have foreseen that the real life Kim would not get the joke, but that he so spectacularly didn’t get it as to terrify Sony, the parent corporation under whose auspices the film was released, into withdrawing it suggests that their idea of him as essentially an adolescent narcissist was more on target than they themselves seem likely to have realized. I was able to see the film because Sony, shamed by imputations of cowardice against it from no less a critic than President Obama but not ashamed enough to release the film in the normal way, made it available for downloading on the Internet by paying customers. At the time of writing it had made back $33 million of its investment in this way, though further costs had also presumably been incurred on account of what was widely supposed to have been North Korea’s hacking into its computer network and the release of embarrassing information of a sort that will be meat and drink to real life Dave Skylarks around the world for some time to come. Those of us who have watched the movie have little to fear from the wrath of Kim at the film-makers’ weaponized "words," since he has not the reach of the jihadists who inspired the murders of more than a dozen people in France in January over cartoons in the satirical magazine Charlie Hebdo. But the one-two punch from these newest members of the critical fraternity had a profoundly disturbing effect on the media, already shaken up by the beheadings of journalists by the Middle Eastern terrorists of ISIS in recent months. "Suddenly," wrote Charles Lane of The Washington Post "satire is the great issue of our time." Except that it really wasn’t. The movie’s "satire," insofar as there is any, is directed at what critics have come to call the Hollywood "bromance" and at the pretensions to moral and intellectual seriousness of the American celebrity culture — though, as generally happens with Hollywood satire these days, it comes to mock and it stays to celebrate these things. About the North Korean junta the movie has nothing much to offer beyond that frankly fanciful portrait of the tyrant as a sensitive and vulnerable youth and a few stereotypes and clichés about North Korea to justify their putatively hurt feelings. Near the end, Dave says to the puppy Kim has given him: "You’re going to America, where they don’t eat doggies!" That and the starvation jokes, of which there are several, may seem in poor taste, but poor taste is just what a movie like this, or a publication like Charlie Hebdo for that matter, is going for. It’s what the people want. In another joke with a resonance beyond what was intended, Dave Skylark tries to sell Aaron on the opportunity the interview presents them. "When you score a Bin Laden, or a Hitler, or an Un, you take ‘em by the balls!" he says. "It’s the first rule of journalism: give the people what they want." "That’s not the first rule of journalism," says Aaron; "that’s the first rule of circuses. Or demolition derbies." Or, he might have added, Hollywood satire. Which may explain the shock with which the violence of the North Korean reaction was received in Tinseltown. It would not surprise me if it were to emerge that the Sony producers who greenlighted The Interview expected when they did so that the dictator and his sycophants would be laughing along with everyone else at the cleverness of the conceit. Of course, the humor of the exchange, also unintended, lies in Aaron’s being wrong and the idiot Dave’s being right, or more right, about the first rule of journalism as it is practiced today, which becomes ever more indistinguishable from demolition derbies. The trouble is that what the people want is not really satire but merely a laugh at the expense of those who don’t like to be laughed at and sometimes find themselves in a position to do something about it when they are. In response to the Charlie Hebdo murders, the whole of the media and the political establishment were as inclined as Sony — or Kim Jong-un — to take the outrage personally. That would certainly be understandable, at least in the case of the media, if the murderers’ offense were construed as having cut them off from mocking, ridiculing or otherwise criticizing the world’s 1.6 billion Muslims, along with one latter-day Nero and a few dozen generals and other oligarchs in North Korea. That’s a lot more material suddenly ruled out of bounds on pain of death. But, for one thing, there was hardly anybody to be found who would admit to having been intimidated. As our own Francophone Secretary of State, John Kerry, put it "The murderers dared proclaim, ‘Charlie Hebdo is dead.’ But make no mistake: They are wrong . . . The freedom of expression that it represented is not able to be killed by this kind of act of terror." Secretary Kerry was, as usual, giving voice to mere bravado, a pious wish expressed as fact, like the oft-repeated mantra that Islam is a religion of peace. In both cases, if it were true, it would not have to be asserted as truth. Of course freedom of expression can be killed. Throughout the liberal democracies of the West it is already barely clinging to life for reasons that are partly to do with Jihadi terrorism and partly with the media’s own enforcement of the liberal and multicultural consensus. Moreover, for all the outpouring of Je Suis Charlie sentiment in France and elsewhere, hardly any of those expressing solidarity with the scabrous paper had any wish to mock, ridicule or otherwise criticize Muslims qua Muslims anyway. On the contrary, they were much more likely to express a willingness to show "the Prophet" and even his most fanatical and well-armed latter-day followers all the respect they think they deserve, and maybe a bit over besides. The fact that so many of those who deplored the massacre disclaimed any wish to offend Muslims or their beliefs cannot be quite unrelated to the already much-narrowed scope for freedom of speech in Western Europe and America. Most of those who wrote to deplore the murders appeared to have been more concerned to warn those less tolerant and enlightened than themselves not to allow their natural feelings of fear and resentment to push them into an unholy alliance with the sort of racists, bigots or neocons who could be expected to take it as justification for their own hateful, anti- Muslim, anti-immigrant views. Such disfavored ones are already denied a forum at universities and elsewhere among respectable people, and we obviously wouldn’t want to find ourselves lumped together with them, would we? The fear of right-thinking progressives in the West appeared to be much less of the terrorists than of the implied imputation against and challenge to their own world-famed tolerance. The urge of so many to rush into print in response to the murders must have arisen out of a belief that what a grieving world needed to hear at that juncture was not what to do about them but how they felt about them. And they felt bad. The pain in their hearts was all the more hurtful because, deep down, they could not but have doubted the robustness of that tolerance, at least among those of their colleagues, friends and neighbors from whom they professed to fear a "backlash" against Islam and the Islamists. That would be, of course, to fall in the "trap" set by the murderers, who would allegedly like nothing better than for such an anti-Islamic backlash to produce the war of religion, or of religion against secularism, that they are said to be seeking. "Serious repression by the French state will complete the circuit of the Charlie Hebdo attack," wrote Hari Kunzru in The Guardian. "It would be a sort of collusion with the terrorists, a collaboration." Like so many of his progressive kind, Mr Kunzru finds a moral equivalence between the terrorists and those who would fight them. Both are said to show "the same parochialism, the same arrogance, the same atavistic lust for violence, the same pathetic need for good guys and bad guys, to be on the winning team." He may not know what he wants to do about terrorism, but he knows what he doesn’t want to do — and what he doesn’t want anyone else to do. To refuse the jihadi’s logic of escalation without becoming mired in grubby pleading, we have to say — and keep on saying, keep on writing with our pens that are supposedly so much mightier than their swords — that life is not so simple, that our many problems do not have single, total solutions, that utopia is a dead place, without life or change, without air. This is the Churchillian moment of France’s Fifth Republic, the moment to face the implacable truth about a test that promises to be long and trying. It is time for us to break, once and for all, with the Leninist reasoning that has been served up for so long by the useful idiots of a radical Islam immersed in the sociology of poverty and frustration. And most of all it is the moment, now or never, for a calm resolve among all believers in democracy to look evil in the face without losing ourselves in the catastrophic measures of a state of emergency. France can and must erect dikes — but not the walls of a besieged fortress. His piece was given the headline: "A France United Against Radical Islam," but it turned out that what he really meant was a France united against those socially dubious types who have unacceptable views about immigrants. "To us as citizens," he wrote, "falls the duty of not reacting to terrorism with fright or by arming ourselves against that obsessive fear of the other that nearly always follows such explosions." He, too, reserves his ringing words for a call, not to action but to resisting any such call from those less liberal and tolerant than himself. Actually, there is one group called to action of a sort. Moderate Muslims, he writes, "have the responsibility — the opportunity — before history and their own conscience to echo the ‘Not in our name!’ with which Britain’s Muslims dissociated themselves last year from the Islamic State killers of journalist James Foley. But they also have the even more urgent duty to define their identity as sons and daughters of an Islam of tolerance and peace." Got that, you Muslims? The president of Egypt, Abdel Fattah al-Sisi, issued a similar exhortation to his fellow Muslims before the Parisian outrage, which could be read as a response to his call for moderation. If the terrorists aren’t listening to him, I can’t help thinking that they’re unlikely to pay any more attention to BHL, as he is affectionately known throughout France. Whence, anyway, comes this "duty" of which he speaks? The idea suggests an Enlightenment understanding of universal moral obligation which, if they had it, would make any act of dissociation from the kind of people who murder journalists unnecessary. It is interesting that he resurrects here the "Not in my name" slogan originating in the anti-war movement of the 2000s. Je Suis Charlie was a kind of variation on the same theme, an attempt to hide from the ugliness of war and conflict by insisting on the purity of one’s own conscience or one’s self-identification with its victims. One can imagine the victims’ themselves, if they could speak, rather resenting this. No, you are not Charlie, they might very reasonably point out, mainly because, unlike us, you’re not dead. But it is clear that what BHL and other such bien pensants are seeking is a way to portray their own moral paralysis not just as a moral choice but as the only possible moral choice. But what if the terrorists don’t care a bit for our agonies of conscience, our desperate desire not to appear illiberal in their eyes, our triumphant refusals to be provoked by their deeds into that fabled "backlash" that never seems to happen? What if it is to them a matter of indifference whether we lash back or not? What if they’re going to go on doing what they do no matter what we do or how we react? What if — and here is the truly all but unthinkable thought — the most important thing about the harsh political realities the terrorists represent isn’t how we, how you and I and the other deep thinkers of the Western élites, feel about them? There’s something almost Kim Jong-un-ish about the self-absorption of Western journalists who believe that what matters most about attacks on Western law and civil society is their own feelings of grief, fear and conscientious objection both to them and to any response to them. Ayaan Hirsi Ali, who has herself spent the last decade under threat of death from jihadis put it best, also in The Wall Street Journal, when she wrote: "If there is a lesson to be drawn from such a grisly episode, it is that what we believe about Islam truly doesn’t matter. This type of violence, jihad, is what they, the Islamists, believe."